CloudSpokes brings the crowd to the cloud. It is the industry's first community for crowdsourcing enterprise cloud development that brings together enterprise cloud challenges and cloud developers to earn recognition and (real) cash. CloudSpokes offers a competitive and collaborative environment for challenges, networking, discussions and jobs involving today’s hottest cloud technologies. First and foremost, CloudSpokes will be a neutral community focusing on public cloud platforms and on members. If there's an exciting cloud technology out there then chances are it already has a challenge on CloudSpokes or will soon. Challenges are already available on platforms and technologies such as Force.com, Facebook, Heroku, Spring, Twilio, Google Apps and AppEngine, Elastic Beanstalk, Amazon Web Services and HTML5 with more coming soon. CloudSpokes community site - register now as the first 500 registrants get $10 of CloudSpokes swag! Facebook app - coming soon! How do you get involved with CloudSpokes? Simply sign up and start browsing active challenges. When you find one that interests you, review the requirements and deliverables and get started developing. Each contest has an accompanying discussion forum so you can network, ask questions and bounce ideas off of other community members. Once a challenge ends, judges will review the submitted code and declare a winner. 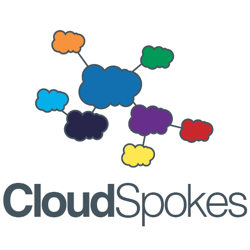 Prize money ranges from $500-$1500 so CloudSpokes should not only be fun but profitable! CloudSpokes is sponsored by Appirio and we are putting our money where our mouth is. We believe that croudsourcing is the best way to tap the imaginations and creativity of the masses to solve modern business problems. We believe in it so much that we are guaranteeing $1M in prize money for CloudSpokes challenges. Yes... that's $1,000,000. Do you have an idea for an #awesome challenge? If so, enter it in our Create an Idea for a CloudSpokes Challenge challenge. The 10 best ideas win $50 each. Easy money, baby! I’m taking an active role in the community so if you have any questions, comments or ideas, please send them to the CloudSpokes Team. We would love to have any positive and/or negative feedback. We have a lot of fun stuff planned!